Eighth-graders Morgan Hardy, left, Sarah Winfre and Mia Vena look through polarizing films during an activity at this summer’s SMASH camp, which encourages girls to study math and science. 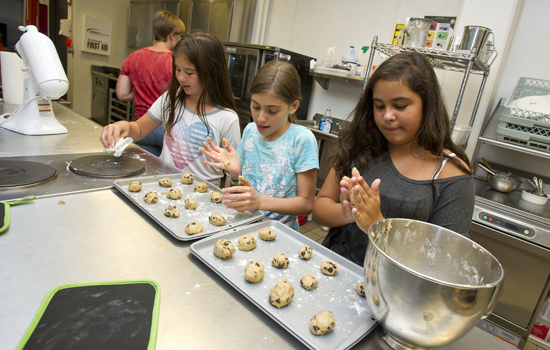 All those summer camps on campus, the visits from school children and the outreach programs into the community are about much more than RIT providing fun, educational opportunities for area youth. These ongoing initiatives focused on kindergarten through 12th grade education are an integral element in RIT’s new strategic plan, a chance to bring potential students to campus to familiarize them with the RIT college experience, encourage children who might not have thought about ever pursuing higher education, even increase the number of students interested in studying in key fields—such as attracting more women and minority students to pursue science, technology, engineering and math. It also helps RIT fulfill a mission to make a difference in the community. 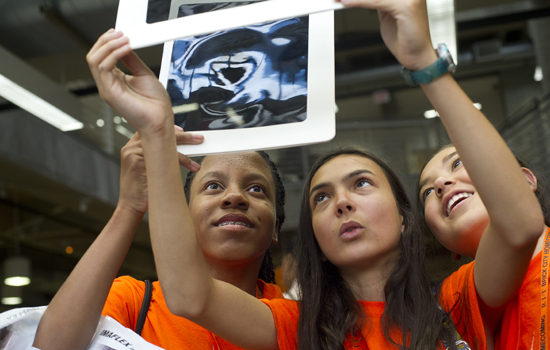 “It’s important for RIT to open its doors for youth before they get to high school, so that they can begin exploring emerging technology and related career skills as well as our academic programs,” said Chandra McKenzie, RIT assistant provost for Academic Affairs, which includes the University Center for Engaging K-12. RIT has been engaged in K-12 education for decades. Several of the university’s colleges run very specific, focused programs. The National Technical Institute for the Deaf annually hosts the Explore Your Future program, where deaf and hard-of-hearing students from across the country spend a week getting a taste of college learning, exploring majors and living in the dorms. Saunders College of Business hosts Future Business Leaders & Entrepreneurs, a 10-week summer program through RIT’s Center for Urban Entrepreneurship. It allows Rochester City School District high school students the opportunity to work directly with Saunders College of Business faculty and students to learn skills that prepare them to become business leaders. 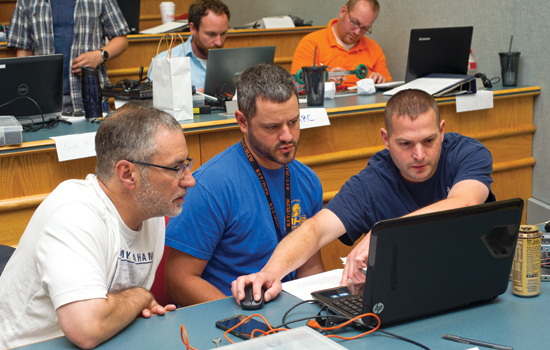 Project Lead the Way offers professional development workshops for K-12 teachers, counselors and administrators from across the country, and also offers RIT college credit to high school students who take specific hands-on, project-based courses that incorporate engineering, technology, science and math skills. McKenzie said an important impetus is RIT’s commitment to make a difference in the community. The university’s new strategic plan calls for developing a national model for the preparation, recruitment and financial support of urban, minority and low-income high school graduates. Those efforts include the Rochester City Scholars program, which provides full tuition for Rochester city school graduates who qualify academically and financially; the partnership between RIT and the Rochester Prep High School (a city charter school operated by Uncommon Schools); and through two grant-funded programs from the state, RIT STEP (Science Technology Entry Program) and RIT Liberty Partnership program, which is open to students in several school districts, including the city. A number of RIT departments also offer an array of summer camps. For example, WE@RIT helps to increase the number of female engineering students through camp experiences specifically for school-aged girls. RIT Kids on Campus has offered computing and tech-based summer workshops for hundreds of youth from all over the region. RIT’s Center for Bioscience Education & Technology holds biomedical science-based summer camps for middle and high school students. Hundreds more area youth enroll in the RIT Athletics department’s summer sports camps, as well as in RoboCamp hosted by the Kate Gleason College of Engineering, and Margaret’s House camp for first- through fourth-graders. Mitch Dehond is proof the camp experience pays off for the students as well as the university. Dehond, 20, of Gates, N.Y., an industrial design major who plans to graduate in 2018, attended Kids on Campus for seven years. For the past four summers, he’s been on camp staff, teaching students most recently about game design. Nolan Morris, 11, of Perinton, N.Y., had heard good things about Kids on Campus from a friend. So this summer, he enrolled in an app class. “I like it a lot. And I’m learning a lot,” he said after his third day of camp, where he was working on making a computer game. Nolan said he plans a career working with computers. McKenzie said RIT’s outreach to the K-12 community helps build meaningful relationships with pre-college age youth and their parents, teachers and guidance counselors.